I2C Controlled 4 I2C Bus Multiplexer With Grove Connectors and LEDs! Do you like gathering data using lots of I2C devices on your Raspberry Pi and Arduino projects? 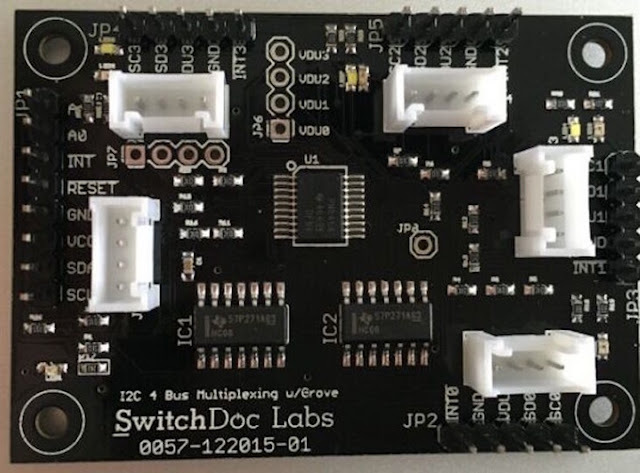 There is a new 4 channel I2C bus multiplexer breakout board solution that allows you to convert one I2C (I-squared-C/I²C) bus to four different I-squared-C buses on your Raspberry Pi and Arduino project! If you already have a favorite breakout board that does not have Grove I2C connectors, you can easily use an inexpensive Grove Connector to Pin Header Adaptor. Rechargeable NFC Card Emulator and Cloning Tool The Size of a Credit Card! How To Add 128 Extra I/O Ports Without Upgrading Your MicroComputer!